Chickens are often underestimated in their capabilities, especially when compared to mammals, which often have more human-like features. However, when studied in their natural environments, chickens show great intelligence and have social hierarchies as sophisticated as those formed by dogs and other mammals. Without a doubt, laying hens are some of the most abused animals in all of farming. While more and more states are instituting farm animal confinement bans, the large majority of chickens still live their lives in a space less than the area of a single sheet of paper. Laying hens are born in commercial hatcheries where they are hatched by the thousands in industrial incubators. Male chicks, unable to lay eggs and of a different strain than broiler chickens, are useless to the egg industry and are killed shortly after hatching. They are typically ground up alive, gassed, or thrown into dumpsters. Hundreds of millions of male chicks are killed by the egg industry annually. Most of the surviving hens are beak-trimmed, a process deemed necessary by the egg industry to decrease cannibalism and other aggressive tendencies, and to reduce feed costs by preventing the flicking of food. Pictures of debeaking were not included here due to their disturbing nature. The procedure, performed without anesthesia, involves slicing off the tip of young chicks’ beaks with a hot blade or infrared. Not only is the procedure itself inhumane, beak trimming causes many physiological changes that prevent birds from expressing natural behaviors. A chicken’s beak is a sensitive apparatus that provides important sensory feedback. Food and water intake and preening behaviors are commonly reduced in birds following this procedure, and chickens are often in chronic pain from the sustained damage to sensory receptors. The female chicks, called hens, spend their short lives (usually less than two years) confined in battery cages, in one 61-square-inch spot. They are unable to perform any natural behaviors, such as nesting, bathing, perching, or spreading their wings. On average, each hen lays 275-280 eggs per year. As the hens age, their egg production naturally slows. To increase production, the hens are forced to molt (shed their feathers) through starvation or the use of low-nutrient food, until 30 percent of their body fat is lost. Hens are purposefully starved for up to two weeks; then, their original diet is reinstated to restore feather growth, and consequently, increase egg production. After their first or second laying-cycle, depending on the use of forced molting, hens are slaughtered. No federal law, including the Humane Methods of Slaughter Act and the Animal Welfare Act, currently sets any welfare standards for birds. Thus, chickens can legally be raised and slaughtered through any methods. Most producers opt not to slaughter the hens on-site, and they transport the hens to off-site slaughterhouses. If the hens survive the journey, they are killed without compassion, and often with full consciousness. These inhumane, painful, and premature deaths are the ends to lives full of suffering. The battery cage, the popular choice of American conventional farmers, sentences almost 300 million hens a year to endless abuse. A typical farm contains thousands of battery cages, each housing three to ten hens with an average space allowance of 61 square inches for each bird. As of 2014, 95 percent of all eggs in the US were produced in battery-cage systems. While the United Egg Producers, representing more than 85 percent of American egg producers, encourages its members to increase cage size to a “recommended” 67-86 square inches per hen, that recommendation is far from kind. Hens need 72 square inches just to stand, and 291 square inches to flap their wings, a figure almost five times greater than the UEP’s “humane” recommendation. While not always perfect, cage-free farms and other battery cage alternatives can fulfill the basic, natural needs of hens–room to perch, room to bathe, and room to nest. While the mortality rates for battery-caged hens and cage-free hens are not significantly different, the quality of life for the hens is much improved when they are given the freedom of barns and the outdoors. Barn systems, a type of cage-free housing, allow birds to move freely indoors. They can be either single-level or multi-level structures. These barns, especially when multi-leveled, provide hens with the environment to perch, nest, and bathe in dust, behaviors that are impossible in the confines of battery cages. Free-range hens have both the protection of a barn and the access to the outdoors necessary to advance these natural behaviors. While it is cheaper to produce eggs with battery-caged hens, the costs of cage-free production are only marginally higher than the cost of the United Egg Producers’ certification program. Consumers are willing to pay more than this difference to ensure the humane treatment and cage-free lifestyle of laying hens. While cage-free hens escape the abuse inherent in battery cages, these facilities cannot always be considered cruelty-free. Hens’ abilities to express these natural behaviors are great improvements, but other inhumane farming practices must be addressed. Cage-free farms still buy their hens from hatcheries that kill the male chicks at birth, and the hens are still subjected to the procedure of beak trimming or debeaking to lessen the effects of aggression. Forced molting continues to be a common practice in the U.S. Finally, the lifespans of laying hens across the spectrum rarely surpass two years, whereas hens in their natural environment would live upwards of ten years. The use of battery cages, and the practice of factory farming in general, causes numerous physical disorders in hens. The inability of hens to move in their cages not only inhibits their natural inclinations toward nesting, perching, and bathing, but also causes physical pain. They suffer from bone weakness and breakage, and numerous diseases including Fatty Liver Hemorrhagic Syndrome, the major cause of death in laying hens. In normal conditions, hens frequently bathe in dust to promote healthy feathers. On most egg farms, they are forced to “bathe” against the sides of the wire cages, leading to feather loss. Without the space to nest properly and with the added stress of artificial lighting, laying hens are highly susceptible to uterine prolapse, a condition in which the uterus is pushed outside the hen’s body. The average hen produces 260 eggs per year; without the protection of nests, the birds are completely exposed after each lay. Psychologically, the worst torture for laying hens is the inability to nest. Unable to find privacy for the laying act in the confines of battery cages, hens will crawl over and under other hens to search in vain for cover and nesting materials. Hens will often pace and throw themselves against the metal sides of the cages, symptoms of severe frustration. The absence of perches in battery cages also interferes with the natural disposition of laying hens to form hierarchies, which increases aggression and decreases normal social interactions. Once the hens reach the end of their laying cycle, the “spent” birds are killed, either on the farm, or in slaughterhouses. The process of catching the hens is both psychologically stressful and physically abusive. Human handling is a known stressor for hens, and the battery cages do not allow for easy removal. Hens are often held seven at a time in the hands of catching teams, and their legs and wings are often torn and broken when they are being removed. Only a few processing plants in the United States accept spent hens; these birds must endure long journeys on overheated trucks to get to these locations. Many die from congestive heart failure due to the stresses of handling and transport. Laying hens are not protected by federal regulations during slaughtering. They do not have to be rendered senseless before they are killed. In the processing plant, hens are shackled by their legs and hung upside-down. They are stunned through the use of an electric water bath, but this method is not perfect. Many chickens are not successfully rendered unconscious prior to slaughter, and are burned and/or drowned alive. Many hens are slaughtered without being stunned at all. The hens’ throats are slit on a circular blade before being placed in a scalding tank, meant to loosen their feathers. If they are not properly stunned, they often miss the blade. This means that the hens enter the tank conscious and are boiled alive. More humane alternatives, such as gas stunning, are being developed, but it is often difficult to implement these large-scale industry changes. Although the entire European Union banned battery cages in 2012, only a few U.S. states do so. In November of 2008, California overwhelmingly passed The Prevention of Farm Animal Cruelty Act. This Act phased out the use of battery cages, gestation crates, and veal crates in California farms. In 2009, Michigan’s legislature passed a ban on battery cages that included a 10-year phase out. In Ohio, there was a moratorium on permits for the construction of new battery cages as of June 2010. Oregon and Washington passed legislation in 2011 to transition commercial egg farms to enriched colony systems. And more recently in 2016, Massachusetts passed a ballot measure prohibiting egg-laying hens, breeding pigs, and veal calves from inhumane confinement. While it may seem like common sense to provide hens with these moderate accommodations, state bills to mandate these standards are often met with strong opposition from the egg industry. In the United States, more than nine out of every ten land animals killed for meat are “broiler” chickens. Professor Emeritus John Webster at the University of Bristol calls the broiler industry the “single greatest example of human inhumanity toward another animal. Most broiler chickens’ lives consist of continuous abuse, from the farm to the slaughterhouse. Due to their small size, chickens make up the vast majority of farm animals killed. And yet, not a single federal law includes protections for chickens. “Factory farms,” known for raising large amounts of animals in minimal amounts of space, breed nearly 9 billion broiler chickens a year in the United States. These chickens spend their lives in warehouse-like sheds, stocked in such high-densities that they are denied many important natural behaviors, such as the abilities to nest, roost, or ever flap their wings. These sheds, called “grower houses”, confine up to 20,000 chickens at a density of approximately 130 square inches per bird. Grower houses are usually windowless, with temperatures controlled through forced-ventilation. Barren except for sparse amounts of litter material on the floors and rows of feeders and drinkers, these sheds greatly frustrate broiler chickens. Many chickens will die from disease and stress related to these overcrowded conditions; however, profit margins encourage the continued use of grower houses. Most “broiler” chickens are selectively bred, a process perfected over many generations to produce the most meat on a bird in the shortest period of time and using the least amount of feed necessary. 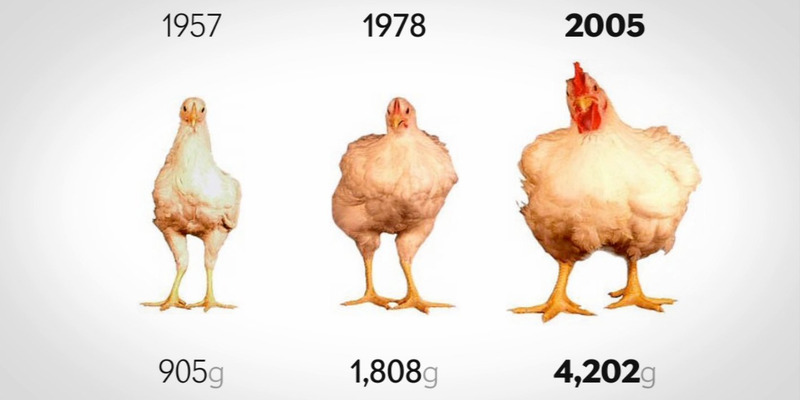 Modern broiler chickens reach market weight in half the time it took chickens in the 1950s, while consuming one-third the amount of feed. While these methods increase productivity, selective breeding severely harms the welfare of broiler chickens. At six weeks of age, most broiler chickens have such difficulty supporting their abnormally large body weights that they spend almost 90 percent of their time lying down. Lying in waste causes ammonia burns on their undersides, leaving their skin bare and raw. Selective breeding can also lead to lameness and other fatal defects such as respiratory disease, big liver and spleen disease, weakened immune systems, ascites, and acute death syndrome. Ascites, a condition in which the heart and lungs do not have the capacity to support an overgrown body, is common in broiler chickens. Broilers are the only livestock that are in chronic pain for the latter part of their lives, a result of selective breeding that severely damages their joints. Some chickens are born to be broiler “breeders.” These chickens have the same genetic predisposition for fast growth, as well as the painful conditions of lameness and heart disease. However, to limit their growth rate, they are fed only a quarter of the amount of food of broiler chickens, leading to undernourishment and nutritional deficiencies. If provided an unrestricted diet, most breeders would not survive more than one year. Breeders are also limited to as little as six hours of light per day, to both reduce costs and control the age of sexual maturity. The darkness not only increases stress and frustration, but often causes blindness in the birds. To reduce the effects of confinement, breeder chickens undergo a series of mutilations; their beaks and toes, as well as combs and leg spurs on males, are removed to minimize the increased aggression related to confinement and starvation. These surgeries are usually performed without anesthesia. Breeders are kept alive significantly longer than their offspring, 16 months versus 7 weeks, and suffer their entire lives. The leg deformities and skeletal disorders that develop before death in broiler chickens become life-long conditions for breeders. These conditions can become so severe that almost 50 percent of breeders must be slaughtered prematurely due to complete lameness or infertility. The environment created by grower houses is detrimental to the physical well-being of broiler chickens. The confinement of large amounts of chickens in inadequate space results in the rapid deterioration of air quality within the sheds. Chicken excrement accumulates quickly on the floors. As bacteria break down the litter, the air becomes polluted with ammonia, dust, and fungal spores. High ammonia levels can cause painful skin conditions, respiratory problems, pulmonary congestion, swelling, hemorrhage, and blindness. Ammonia also destroys the cilia in the chickens responsible for preventing other bacteria from being inhaled. During winter, when the ventilators are closed to conserve heat, ammonia levels may reach 200 parts per million; healthy ammonia levels should never surpass 20 parts per million. Broiler chickens live stressed and frustrated lives, confined in sheds that cannot offer even enough space to stand, turn around, or spread their wings. The ammonia levels created by the poor ventilation in grower houses limit the broiler chickens’ sense of smell, rendering them unable to truly perceive their environments. Metaphorically, they are forced to look upon a dark room through dark glasses. Broiler chickens spend an average of 45 days in the grower sheds. Once they have reached market weight, they are transported to outside facilities for slaughtering. For the birds, the journey to the slaughterhouse is physically and psychologically abusive. Catching teams load the chickens at rates of up to 1,500 birds an hour, injuring many in the process. From dislocated hips and broken wings to internal hemorrhaging, the chickens suffer due to rough handling from this fast-catching rate. During transport, the chickens are denied food, water, and shelter. The crates are often improperly covered, and the birds are exposed to high winds and cold temperatures. The unfeathered parts of their bodies become red and swollen, and sometimes even gangrene. Many chickens die during the trip from hypothermia, or from heart failure associated with stress. Similar to laying hens, broiler chickens are not protected by federal regulations during slaughtering. Many alternatives to these inhumane slaughterhouse practices exist, from the use of mechanical harvesting or herding, to a more caring, gentler way of manually catching chickens. The waste from broiler chicken factory farming has dire environmental consequences; read more from the Pew Environment Group. Chickens in a flock recognize each other by facial features and can remember more than 100 chickens at a time. They prefer to avoid unfamiliar birds. Chickens are able to understand that an object hidden does not cease to exist, showing a fairly advanced level of cognition. Hens have an innate need to nest. A major source of frustration for caged hens is not having any access to nesting materials. This frustration can cause injurious behavior like feather-pecking. A mother hen begins bonding with her offspring long before they have hatched, turning the eggs more than five times an hour and clucking to the unborn chicks. Chicks learn everything from their mothers, and will often huddle together at night until they are able to roost on their own. Chickens have complex vocalizations. They will emit a different alarm call if a predator travels by air than by land. Chickens live in social groups of up to thirty members, and establish strict “pecking orders.” In fact, that is where the term “pecking order” originated. The flock coordinates its activities so each chicken bathes, eats, and nests together. A single chicken will forage for food up to 10,000 times a day naturally.